Even though Gov. Pat McCrory has said the tolling project along the Interstate 77 corridor north of Charlotte will go forward, it faces a challenge to its constitutionality, as well as allegations the contractor did not meet full-disclosure requirements. The lawsuit, filed in January by the nonprofit organization Widen I77, claims the deal violates the state constitution. Among other allegations, the lawsuit charges that the General Assembly delegated too much authority to the N.C. Department of Transportation, which will allow the contractor to set toll rates without legislative oversight. In addition, the lawsuit claims a provision in the contract for NCDOT to compensate I-77 Mobility Partners LLC for state and federal tax liability if the state terminates the contract also is unconstitutional. NCDOT closed the deal with I-77 Mobility Partners on May 20 to build what is officially called the I-77 Hot Lanes Project. The 26-mile-long project, running from Charlotte to Mooresville, is expected to cost $648 million. Mobility Partners will set toll rates, collect the tolls, and — for the most part — keep all the proceeds. This would be the second toll-road project built in North Carolina and the first using a public-private partnership. In addition to the lawsuit, Diane Gilroy, a Cornelius resident and a Spanish professor at UNC-Charlotte, lodged complaints in July with Attorney General Roy Cooper and NCDOT Inspector General Mary Morton, claiming that the parent companies and affiliates of I-77 Mobility Partners failed to disclose fully all past legal problems as part of the bid process. 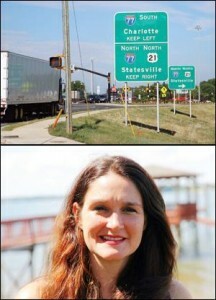 An NCDOT spokesman acknowledged that the agency is looking into her concerns. Opponents of the project want the state to build additional lanes without charging tolls, and pay for them using existing funding mechanisms or with highway bonds McCrory has proposed. Robert Poole, director of transportation policy at the Reason Foundation and a longtime advocate of privately financed toll roads, told Carolina Journal he continues to support the project as a way to relieve congestion along that segment of I-77. He also acknowledged that the proposal had significant opposition. “This is perhaps the most in-depth opposition to a toll project I have seen in the country,” he said. Charlotte attorney Matthew Arnold filed the lawsuit for Widen I77 on Jan. 20 in Mecklenburg County Superior Court. The goal of the lawsuit is to stop the project. At press time, according to the organization’s founder Kurt Naas, the case had not been scheduled for trial. The lawsuit alleges the General Assembly unconstitutionally delegated NCDOT legislative powers to set toll rates without adequate standards or safeguards; to allow Mobility Partners, a private entity, to receive an unlimited rate of return on investment for a project intended for public benefit; and to compensate Mobility Partners for its tax liability. The lawsuit claims that only the General Assembly can set toll rates and taxes, thus making the delegation of authority unconstitutional. The lawsuit also claims the contract is illegal because under state law NCDOT is not allowed to convert an existing nontoll lane to a toll lane if such designation would reduce the number of existing nontoll general purpose lanes. The lawsuit states that the construction of the high-occupancy-tolling project would convert a general-purpose, “free” lane into a toll lane. The lawsuit also claims the contract is illegal because it does not require proper disclosure of proposed toll rates to state authorities. State law says prior to the effective date of any toll or fee for use of a turnpike facility, the North Carolina Turnpike Authority shall submit a description of the proposed fee to the Board of Transportation, the Joint Legislative Transportation Oversight Committee, and Joint Legislative Commission on Governmental Operations for review. The lawsuit states the contract does not require Mobility Partners to submit proposed tolls to these bodies. Diane Gilroy is the wife of Cornelius Town Commissioner Dave Gilroy, and one of the many local opponents of the project. She claims in the two letters that the agreement between NCDOT and Mobility Partners should be invalid because the company failed to disclose to NCDOT all of its legal problems as required. She based her claims on reports from Spanish news organizations. Gilroy told CJ the company failed to disclose six controversies involving its parent companies, Cintra and Ferrovial, or their affiliates. In her letters to Cooper and Morton, dated July 12, Gilroy stated there were a number of “convictions, lawsuits, investigations, etc., against Ferrovial Agroman and the parent Ferrovial S.A.,” and that these incidents were never disclosed to the public and elected officials before the contract with Mobility Partners was signed. Her first example was a bribery case centered around the “Palau de la Musica,” a concert hall in Barcelona, Spain. The independent Spanish news agency Europa Press alleged that Ferrovial paid more than 6 million euros to the music hall that were described publicly as donations but actually were kickbacks to a political party and senior music hall officials. The music hall officials have been indicted, but the fate of others is unclear. Europa Press and other news sources allege the kickbacks helped Ferrovial land public works projects worth more than 1.2 billion euros. The case has not gone to trial. NCDOT’s I-77 website lists several public documents connected to the project. One is a three-page document titled “Form C Certification,” but the form related to this project is blank. The unanswered questions on Form C asked for disclosure by bidders of indictments or convictions of bid contract or related crimes in the past 10 years. The form also included questions about bankruptcies or civil lawsuits involving bidders. Gilroy said that six situations should have been disclosed on Form C Certification and that she had been unable to obtain the form as completed by Mobility Partners from NCDOT. On July 24, NCDOT provided CJ nine completed versions of the three-page questionnaire from I-77 Mobility Partners or its affiliates dated Nov. 26, 2013, Feb. 12, 2014, and March 13, 2014. In those answers, two of the six situations raised by Gilroy were noted, including the “Palau de la Musica” situation described above. NCDOT spokesman Steve Abbott told CJ, “in accordance with standard policy, the Office of Inspector General is reviewing [Gilroy’s] claims.